I remember when I was much younger, how my mother would like to hover around the fragrance counter and look over the new releases. And I’d marvel whenever the sales associate would just hand over some cute little glass vials filled with fragrance. Later on, my mother would let me try some and I’d find myself puzzling over how pretty and delicate those little sample vials are. These days, you’d be hard pressed to find sample vials at some stores as fragrance houses seem to have gotten stingier with their sample stock. I also remembered the very rare occasion when a sample vial would get deposited in the mailbox. This had, in fact, only happened on two occasions and then nothing since. Part of me thinks the reason sample vials don’t show up in mailboxes anymore is because of the cost. But another part of me knows that some people just don’t like the idea of finding a little glass tube in their mailbox filled with a fragrance that might be too strong or that they just don’t like. My other frustration stems from the fact that department stores have gotten incredibly stingy with their samples over the years. A decade ago, if I expressed some interest in a fragrance I got a sample. These days, it’s only a few stores that will provide samples for me. And those samples work! I’ve purchased a number of full sized bottles because a sample charmed me into it. But it seems that practice is a bit rare these days, as fragrance counters hold onto their vials and the only time I ever really get offered a sample is if I buy something–and even then, it’s up to luck and the mood of the sales associate. So in the stead of glass vials filled with scent, the fragrance companies have come up with a somewhat frustrating method of delivering their samples–at least by mail and print. For the longest time they’ve been wedging scent between sheets of paper, gluing them together, and wedging those pieces of paper inside of magazines and sales flyers. I have to say, I vastly prefer the vials you can still get at some stores over this paper card business. There’s a luxury to the glass vials that you just don’t get out of a paper card. 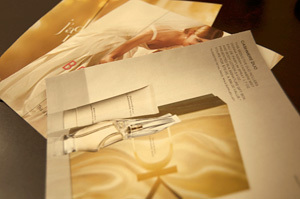 The vials are also much more effective at containing a fragrance as opposed to some paper. And needless to say, you can try the scent on yourself if you’ve got a vial of the stuff. I’d hate to think of people rubbing these scent cards on their wrists and getting a faint and skewed impression of a fragrance. At the moment, I’ve got three scent cards plucked out of a Dillard’s sales flyer; J’Adore, Estee Lauder’s Beautiful, and Donna Karan’s Cashere Mist. I’ve reviewed or have it in my queue to review all three of these fragrances so I keep them around simply because they smell nice and they were free and someone else would have thrown them out anyway. I can’t say they’re filling me with the desire to go buy any of them as they’re all giving out an absurd amount of scent despite none of them having been opened yet and in a month or less they won’t smell like they should anymore. It seems like a less effective practice to me. And the fragrance industry, despite periodically being annoyed about counterfeits, grey markets, and other products of “lesser value” are sure not conveying the same amount of luxury and prestige they could be projecting if they brought the glass vials back. I don’t necessarily want the vials to show up in my mailbox or wedged in some magazine. I just want those little vials to be a bit more plentiful at a department store. This entry was posted in editorial and tagged editorial. Bookmark the permalink. I can’t recall the last time even one sample vial of scent was available or offered to me at a department store. Instead I’ve been given the odd foil-wrapped peel-back-and-sniff samplette, for want of a better word. Maybe encouraging the mailing of such samples is the way to go, to reverse the perfume industry’s trend away from such helpful action? I’ve had “good” luck at Chanel and Guerlain counters with those free samples, but both times I had to buy something first. And then very often, they only had an abundance of samplers of the same fragrance. I’ve got about five vials of Aqua Allegoria Nymphea sitting around and four of Chanel Chance. I love those little vials, but I wish they’d carry more variety. I’m happy to hear about those free samples from online ranges. I think they really work to sway someone into buying or at least in coming back. I only wish the big houses would see that people easily ignore this foil-peel-and-sniff or glued paper card business. As for the paper inserts, I found a good use for those. I keep them in my car. And I open one once a week and use it for air freshener. I have the best smelling car in town! Yes to getting to know your sales associate. It’s always good to be on good terms with people. I knew a lovely woman at a Guerlain counter in Canada who was happy to entertain my occasional wanderings among the stock and was happy to give me some samplers when I asked. I also hadn’t thought of using those paper samplers as car air fresheners. Come to think of it, my linen closet can use some freshening up too.